Since the 1980s unions have been almost constantly on the defensive, facing a relentless neoliberal offensive by the bosses. Despite some spectacular rearguard struggles, the trend has been toward defeated strikes and a retreat by the unions leaders. This had a big effect in weakening the confidence of workers that they could win gains by striking. Yet strike action is the main weapon the working class has to improve its living standards. The failure of labor to win improved living standards – combined with a union leadership in retreat – weakened the ability of unions to attract other workers who are seeing their living standards and conditions on the job decline. This decade started with the Wisconsin uprising in 2011, which had enormous potential, but was derailed by a combination of the labor leadership and the Democratic Party. 2011 also saw the sudden emergence of Occupy, as an expression of the increasing class division in the U.S. Signs of a fight back have increased in recent years. There was the UFCW organizing at Walmart, fast food strikes, and important strikes by nurses, teachers, and communication workers. This year has seen important new developments. Most visible has been the teacher uprising in the South and Southwest. These strikes contain a number of important new features: 1) rank-and-file based organizing; 2) adoption of a program that broadened the appeal to wider group of workers; 3) refusal to be limited by the union leadership’s narrow strategy; 4) taking on state legislators and, in the process, turning around the whole political narrative; and 5) winning clear victories. Since then, there has been an important uptick in strikes, and also strike-authorization votes. Most important is the situation at UPS (see page 10), where a possible strike could have a huge effect on the U.S. economy. At present there is a strong mood to vote “no” on a very poor tentative agreement which could well be defeated, despite an all-out push by the Hoffa administration. The hotel strikes in Chicago are a major development and has sparked a strike authorization vote among hotel workers in Boston. A wave of teachers’ strikes in Washington State in September shows the teachers’ revolt is far from over and there is the possibility of a major strike by LA teachers. 30,000 steelworkers at Arcelor Mittal and U.S. Steel have passed strike authorization votes. There is also a bit of an uptick in overall union membership as more young people join unions. Of course, underlining this increase in union activity has been the savage attacks on living standards and working conditions on the job, particularly directed against young workers, women, and people of color. Further, the spiraling cost of housing affects all workers and many middle-class people. A new understanding is beginning to develop that only by collective struggle can improvements be won. A recent article in Jacobin by Erin Dirnbach explains that there is a dramatic increase in the number of large work stoppages, albeit from a very low level, with 16 in the first half of the year. At this rate the number of large work stoppages this year will be the highest since 2000. 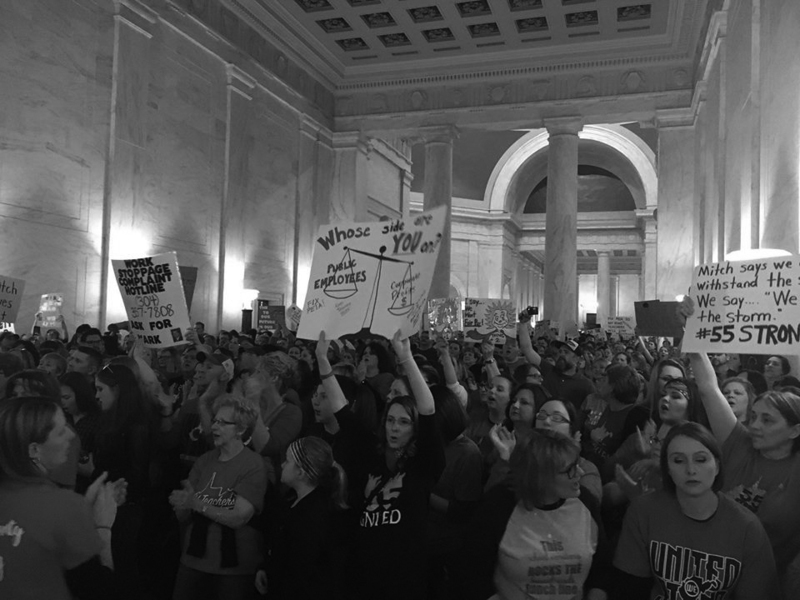 The article goes on to point to the “overwhelming public support for striking teachers this spring in such red states as West Virginia, Oklahoma, and Arizona…the venerable education pollster PDK, found 73% support for teachers’ strikes, and a remarkable 78% support from parents of school-age children.” Further evidence of the shift in public opinion was the two-to-one vote to overturn a right-to-work law in Missouri this summer. The recent struggle by International Union of Operating Engineers Local 302 in Western Washington, who operate cranes, lifts, and heavy equipment essential to the massive local housing boom shows the mood to fight is spreading to sectors normally considered more “conservative.” A rank-and-file group organized two successful no votes on contracts similar to those accepted by the rest of the building trades. A strike vote was passed by a very small margin of votes against the leadership. The resulting 17-day strike shut down all major union construction sites in Western Washington, including Seattle. Cranes across the region stood conspicuously silent. The union leadership were dragged into a strike they did not want. Quite quickly, coordination of the strike was taken over by a rank and file grouping which communicated through a closed Facebook page. The strike won most of its demands, although the ratification vote has not been completed. These struggles happened against the background of union membership in the private sector falling to below 7% of the workforce, and a continued ruling-class offensive against public-sector unions. The recent Janus decision effectively makes the whole public sector nationally “right to work.” The biggest challenge is the need for fighting leadership. This is why the beginnings of alternative leadership – including the role of socialists – in the teachers revolt is so important as is the role of more militant unions like the National Nurses United in pushing the labor movement as a whole.